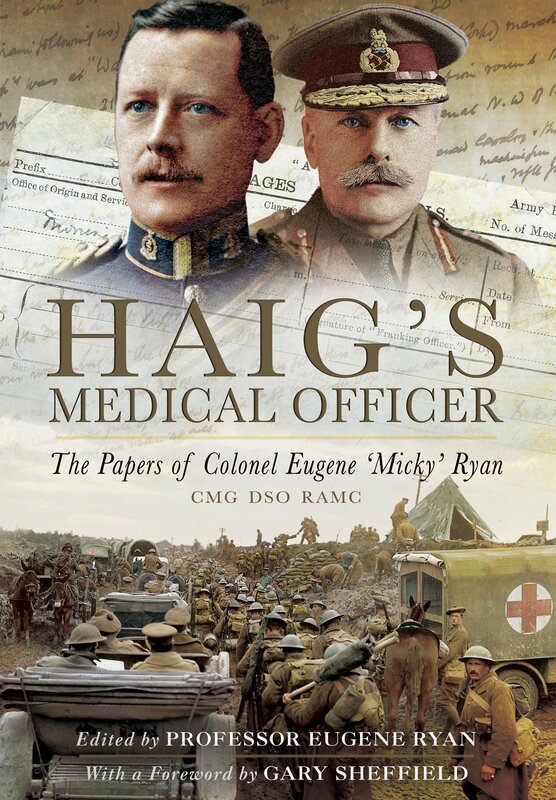 Eugene ‘Micky’ Ryan had a long and distinguished career with the Royal Army Medical Corps, seeing active service in the South African War as well as the First World War. He met Douglas Haig in 1912, and in December 1916 was made his personal Medical Officer, treating not only Haig but his family as well. The two men developed a close bond that was to last until Haig’s death in 1928. Ryan was a prolific writer during the war, sending regular letter homes as well as keeping a personal diary. These form the basis of this book. A general narrative of the war is used to give a large number of diary and letters context. Diary entries often provide details of the overall situation, rather than operational detail of Ryan’s work. Many of the events have been corroborated from other sources such as the diaries of Haig and Charteris, although this does lead to some repetition and means that several accounts of the same event are depicted. The letters and diary entries paint a personal, first-hand picture of Haig that can be difficult to glean from other sources. Ryan saw him as unfailingly loyal to his men, and that he likewise inspired a similar level of loyalty in return. However it should be borne in mind that this opinion comes from one who was evidently in favour in Haig’s immediate ‘clique’, and who had a very different war to the average soldier in the trenches. Despite his status Ryan was not safe from danger, nor was he averse to carrying out his duties under fire; for example on 4th November 1914 he came under shellfire but attended the wounded whilst shells were still bursting around him. His response to the incident highlights either his modesty or his desire to hide the danger he was in from his wife. The level of editorial detail provided is impressive, particularly the research that has gone in to providing further information about the places and names referred to in Ryan’s diaries and letters. Footnotes and short biographies provide further background about people referred to in the text, however in some cases providing details of every location that Ryan visited or stayed in seems unnecessary and does detract slightly from the narrative. The book is relevantly illustrated with many pictures from the family archive, many that have probably not ever been published before. The author has chosen to include many pictures of the letters and diary entries that are transcribed in the text anyway, but the remainder are varied and serve to illustrate the text well. This is an interesting book and one that can deservedly claim to be ‘unique’ amongst the veritable flood of memoirs and personal accounts currently available. As well as depicting a more personal side of Douglas Haig that challenges some of the preconceptions that are often held about him, the book also provides an interesting account of one man’s war and how he conveyed his wartime experiences to his family back home.